Tonight's review is a cigar that is all the rage on the web since its release yesterday (see post below.) The NHC Seleccion Limitada is a project that Dan Welsh (@nhcdan on twitter), owner of New Havana Cigars, and Pete Johnson (@tatuajecigars on twitter), owner of Tatuaje Cigars, worked together on to create a house stick for New Havana Cigars. There are two versions of the NHC Seleccion Limitada.One of them is rolled with a Habano wrapper and is called the Natural. The other, named the Reserva, is rolled with a Broadleaf wrapper. Both cigars are rolled at Don Pepin's My Father factory in Esteli, Nicaragua. 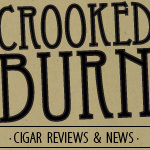 I have smoked each of these cigars once already and I can tell you, even before this review, that they may be the same filler blend, but they have two distinct flavor profiles. Dan hooked me up with a few samples of each and I want to give him a very public and loud thank you for giving me first dibs on their reviews. Tonight's review...the Natural. Let's fire it up. My NHC Seleccion Limitada Natural had a milk chocolate-colored wrapper that was smooth to the touch, but still had a lot of small, visible veins running all over it. The band on the cigar was understated and had that classic cuban style to it. This was a long vitola and, when pinched from head to foot, felt evenly packed. The pre-lit aroma consisted of some rich earthy smells mixed in with hints of cedar. I easily clipped the expertly-applied triple-capped head. The pre-lit draw was free with just a bit of resistance. The flavors I got from the cold draw were a strong mix of woodiness and sweet natural tobacco. I used a soft flame lighter to light my NHC Seleccion Limitada Natural. The cigar immediately produced a large volume of smoke.The draw was perfect with strong initial flavors. I picked up a lot of mild black pepper (that classic Tatuaje flavor) with strong notes of cedar and honey. It was not a sweet honey, but more of what I can only think of as raw, pure honey. The finish on the cigar was very smooth on the palette and left some lingering spice on my tongue for about a minute after exhaling. The burn started a little wavy but corrected itself with no problems while resting between puffs. The ash was tight and held on for about an inch during the first third. I would say the body was a solid medium. In comparison with other Pete Johnson sticks, it was much stronger in body than a El Triunfador, but no where near a Havana Cazadore. The second third of my NHC Seleccion Limitada Natural was similar to that of the first third, in that it had very strong flavors but the flavors themselves had changed. The black pepper and cedar had faded, leaving noticeable notes of raw honey blended with a very nice cinnamon hit. These two flavors mixed perfectly and had my taste buds at full attention. Right in the middle of the cigar, I got a few hints of coffee but that lasted no more then two or three puffs. One thing that was quite different in the second third was how long the ash held. I was smoking on a pretty breezy back deck and, as you can see from the picture above, the ash was strong. The body picked up ever so slightly, making the smoke even more relaxing. The final third brought yet another flavor profile evolution. The mild black pepper had resurfaced and was accompanied by a strong cedar taste on the forefront -- even more so than in the first third. I could still distinguish the honey and cinnamon notes, but they were nowhere as pronounced as they were in the second third. The finish on the cigar changed a bit, too. On the exhale, I got a slight tingling feeling on my tongue. I thought it was worth mentioning, to see if anyone else gets this. Right down to the nub, the cedar took over and was the only flavor coming through. The body stayed consistent to the second third with a relaxing medium to medium-full. 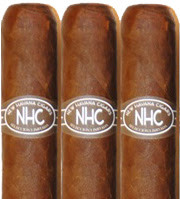 My final impression of the NHC Seleccion Limitada Natural is this is a home run kind of cigar. Pepin, Pete, and Dan have really done wonders with choosing this blend and created a very complex and strong-flavored stick. Speaking of the blend, the quote from the New Havana Cigars website says that it is "based on an original Tatuaje blend." I have no doubt in my mind that this is based on THE original Tatuaje blend, the La Seleccion de Cazador, or better know as, the brown label. Which blend within the brown label, I have my guesses on but I'll leave that up to you to form your own opinions. If I can give one piece of advice on this cigar, it is to smoke it slow and take your time. This stick has lots of flavors that are in your face, but when smoked slowly, they really melt into each other creating a very interesting and relaxing experience. Would I buy it again? I would buy a lot of these cigars. A soon-to-be classic Tatuaje cigar at $7.20 a pop (in box purchase price) I don't see how you can beat that. The only problem is, once people start smoking these, I don't think they are going to be around for very long. nice review dan, im looking forward to trying these. my sampler shipped today from NHC! Nice review Dan - I placed my order for some, can't wait to try them! Calling one of your sponsor's cigars a "classic". Shocking. Mijo, great review man. I need to order a few. @ Anonymous -- A classic is a classic. Everyone knows that you can't fake a great cigar. If it happens to come out NHC, all the better because I like to see good things happen to good people in my local community. I'd like to hear what you have to say AFTER you smoke one, but please leave the anonymous at the door. That's just weak. Whoa. That was a joke(must have forgotten the ;) ). Clearly not a funny one i guess. I love the blog and they dont come any classier than Dan at NHC. I have yet to try one of these but hope to soon. In regards to the anonymous, i dont have the appropriate account from the drop down but feel free to contact me at cigarsmoker08 at yahoo. A friend and I talked with Pete Johnson at CigarFest last Saturday for about 45 minutes and I think this must be the cigar he mentioned that was coming out...he said it was a former Tatuaje blend that he had stopped making and after he tasted it again for this project he regretted giving it to them...he wished he had kept making it for his own company all along. Definitely have to give this one a try. Thanks! than the tubos that came out with such fanfare. And yes I made box purchases of both the red and black.